Every time I come here, someone grabs my heart. This time, it is a man called Tamring. He is a simple man. 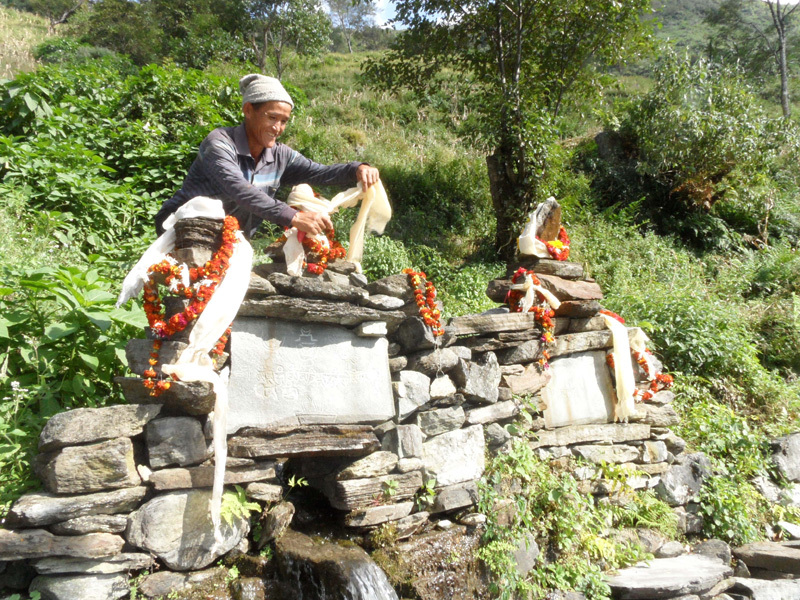 His home is in Khandbari in eastern Nepal just down the path from the student hostel. He farms another man’s land, keeping half the crop for his own. When we needed a porter to carry our bags during our ten day walk up the Arun Valley, Sunita, our guide, asked if he would come with us. When I first saw him, I thought he was older than I am. But he is 11 years younger. I’m often surprised by looks here. A life out in the sun and weather makes people appear older. The first day I knew we were in good hands. He watched us carefully, and matched his steps to my own slow ones. He was infinitely patient. No matter what pace I attempted, he was there, guiding my way. I’d look back at him and he’d let me know which fork I should take. He’d go ahead at times and be waiting halfway up the hill, having put down his baggage, knowing I’d need a break before the next climb. And if I slipped or skidded, he was right there with an hand on my arm, steadying me. 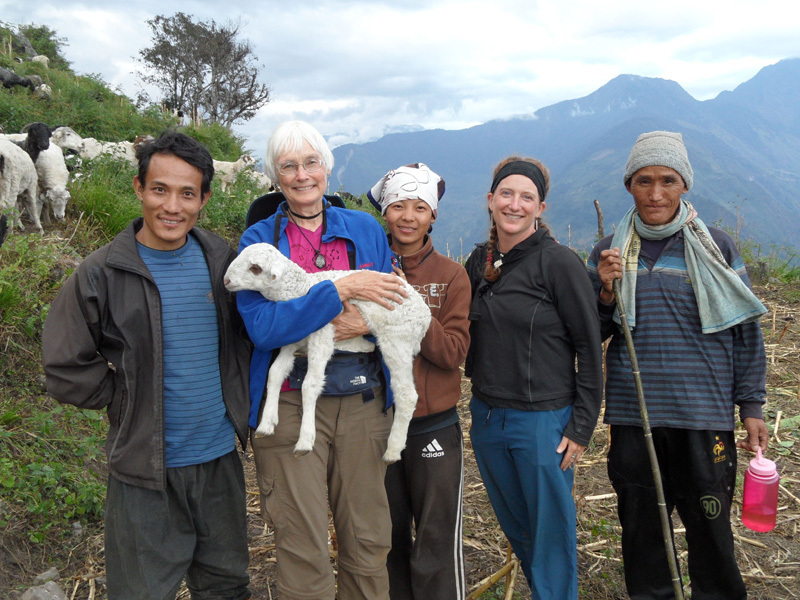 We tried to speak to each other in my limited Nepali, as he spoke no English. He’d point out a mountain or stop and indicate the next village we were headed to far away down in the valley. We learned to “talk” and joke with small phrases and looks. His character became more apparent as our trip progressed. Whatever needed to be done, he would do it. If cardamom seed was being packed into 30 kilogram bags, he’d hold the scale for the local men, sweep up the fallen seed, steady the huge sacks and simply be helpful in any way he could. Someone would hand him a baby to be held and he’d entertain the child while the mother cooked our meal. He’d unpack our bags from the doko (woven basket) in which he carried them, and bring them up steep narrow stairs to our room. He’d never let us bring them down again in the morning, instead waiting near the stairway for an indication that we were packed up. He tended my walking stick, never letting me forget it, and watched our daypacks if we wandered off to look at a bird or talk to a child. Helping me filter my water and pouring it into my Camelback for the next day’s walk was a regular daily task he took very seriously. He smiled often and observed always. Discovering he liked the games Mary and Thea had brought, we asked him one day if he wanted to play Yatzee. He won the first game he played! We played many games of Yatzee after that, and he always indicated his enjoyment. I was so sad to leave his company on our return to Khandbari but we remembered we had one more walk of several hours down to the river to catch the jeep ride back to Hile and on to Kathmandu. We had Sunita ask if he was free for a few hours to walk with us and he agreed. We set off at 7:30 am, and about 10 we reached the river. He indicated he would cross the river with us, piled our packs into the dugout canoe and hopped in. 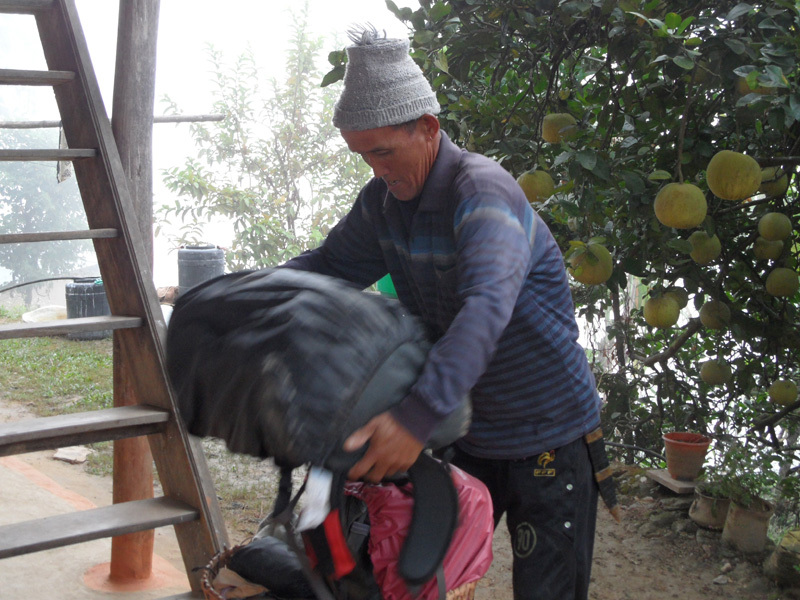 On the other side, he again pulled on the packs and went up the steep path to the road, then started walking again. We followed to a small rustic cafe, where he put down our packs and talked to the owners. It appeared that jeeps come by periodically, on no set schedule, and we were to wait for one there. We ordered tea all around and shared cookies. Tamring then wandered off, watching for the sign of a jeep. One came by going the opposite direction, and they indicated to us they’d be returning in about an hour. Two hours later the jeep came back. It was full. So, more waiting. We told Tamring that he could go home and it wasn’t necessary for him to wait with us. But he indicated he had no intention of leaving until we were safely on our way. At 2:15 PM, we finally were able to pile in the back of a crowded jeep, and we said our quick goodbyes to Tamring. He had spent his whole day helping us, far beyond what we’d intended. But I should have expected nothing less. He continually showed me how I ought to be, looking for opportunities to be of service, quietly, without expectation, and finding joy in each moment. 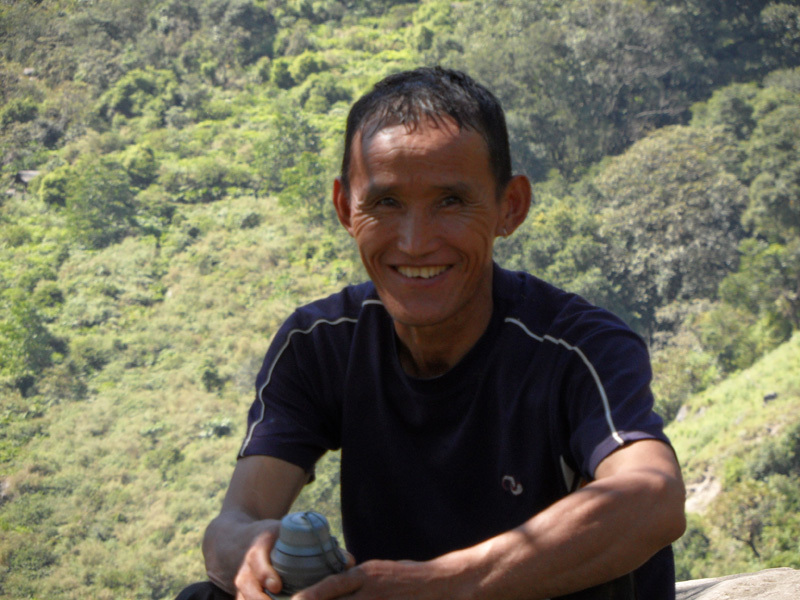 I’ll never forget this fine man, the soul of Nepal, living a life of generosity of spirit.